← You Are Invited to Participate in the 24th Moose Jaw SK Shuffleboard Tournament at the TE Center. Archival Item: Bergs, Erika and Peter, Meet the Hussmanns, Birgitt and Dieter!! January 30th, 2006. Stan McCormack Writing on 2006 01 30 PRESIDENT HUSSMANN and wife BIRGITT KEPT ON THE HUSTLE!! Peter Berg Speaks: “Last week was quite hectic for Erika and me. As you suggested, we met Dieter Hussmann, President of the German SBA. We found him and his lovely young wife Birgitt very enthusiastic about their newly discovered sport. In Dieter’s own words. “Since my soccer days are almost over I found a wonderful sport that my wife and I can play for many years to come”. In today’s e-mail he writes: “”I can’t remember any other week in my life, of making more friends than I did in Florida during that time. It is definitely one of the greatest rewards, besides playing this wonderful game””. Thursday was a Turkey Shoot at Ruskin, (that’s were we met the Hussmans for the first time). It was a well organized Tournament with Bratwurst and Hamburgers all for $3.00; how can you beat that?? I personally had a bit of luck, by taking #1 spot in the friendly Turkey Shoot. We also met Jim Allen there. He invited us for a Dutch/German Tour in the spring of 2007. We will definitely think about that offer. THE HUSSMANNS, DIETER AND BIRGITT THANK FL SHUFFLERS!! This e-mail from the President of the German Shuffleboard Association. (Dieter Hussmann) writing in 2006 01 31. We would like to thank you very much for the warm welcome you offered to us during our visit in Bradenton. It was wonderful for us to be acknowledged by so many nice people. 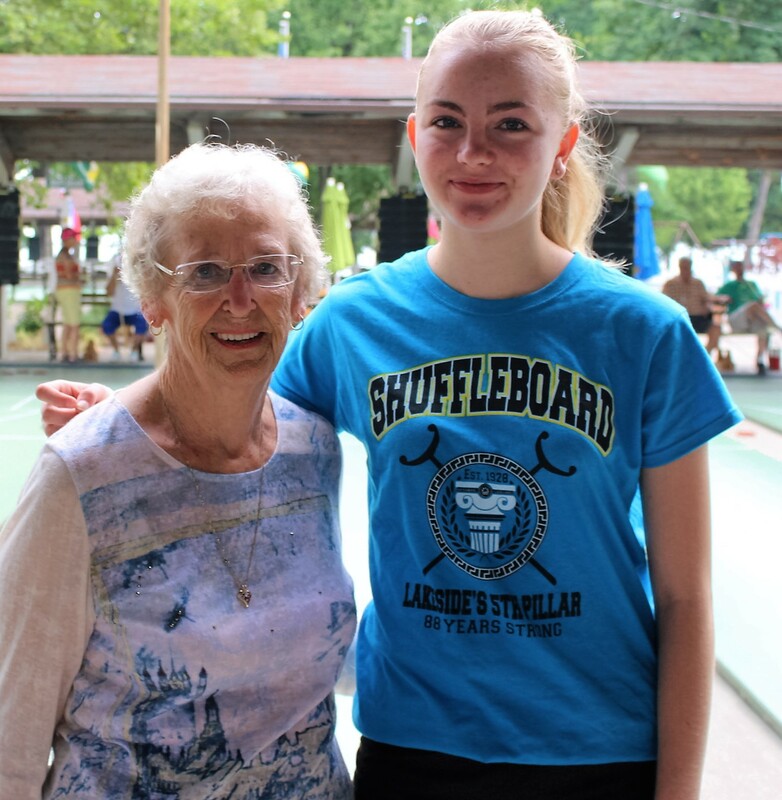 Our enthusiasm for Shuffleboard has been boosted even more with our stay in Florida and we hope our excitement will be contagious to other Shufflers in Germany. GERMAN PRESIDENT HUSSMANN REMARKS on the Occasion of Germany’s first 1st ISA participation..
Stan Speaks: At the Windup Banquet of the 25th ISA Meet in Lakeside, OH (Aug of 2006) I took the opportunity to speak with the President of the German Shuffleboard Association ~~ Dieter Hussmann. We began the conversation by expressing our delight that 4 German players had entered the Win Column!! 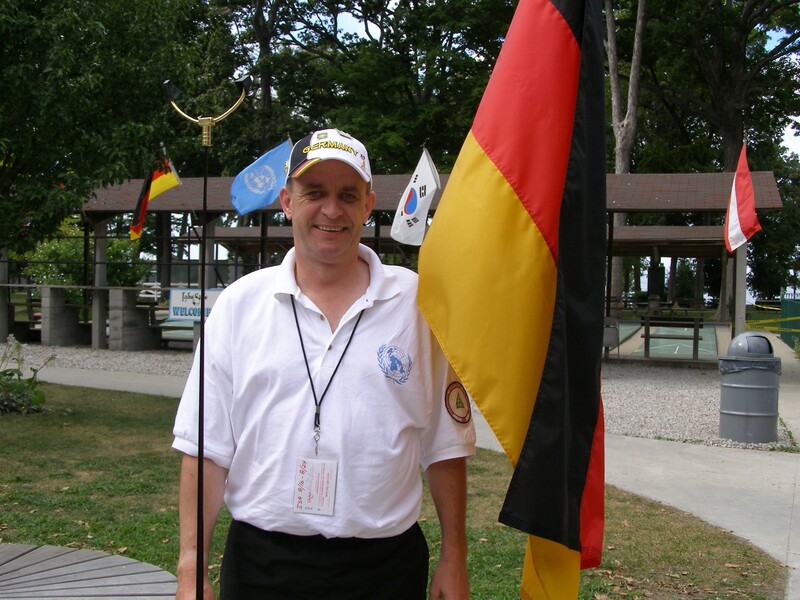 Dieter responds: “Yes, it is so exciting that each member of the German entry (UN Team) has managed to make their 1st win. Kerstin won her last match to-day and Birgitt managed to make her 2nd win to-day and we are very glad that it worked out so fine for Germany, and we would like to thank all the shufflers and everyone who contributed to our first appearance here and we are really glad to be here at the 25th International Shuffleboard Tournament.” Stan: I would just add a rejoinder to that; we are so glad to have Germany participating, and of course so glad that the German Players have done so well. Thank you so much for coming and we look forward to your participation in Canada in 2007. Stan’s Note: Later in the evening, THE SHUFFLER presented a Shuffler cap to Dieter and Sebastian ~~ see pic in the margin. 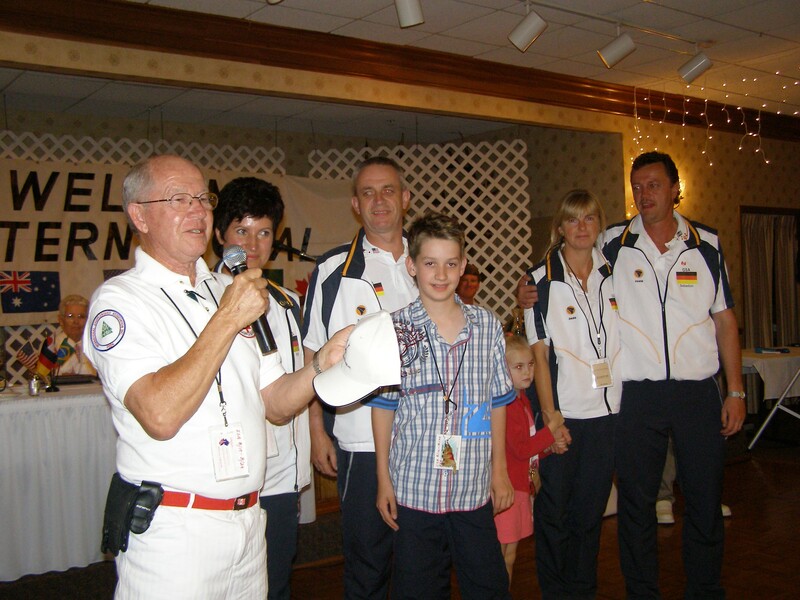 The German children accompanied their parents to the event and were given instruction in Shuffleboard. Stan McCormack of THE SHUFFLER. (THE SHUFFLER is a joint venture by Alf Primeau and Stan McCormack) 2006 08 26. Stan Speaking in 2018: See that ‘little girl in the red dress, above and below !! She is a daughter of the Runge Family, Kerstin and Sebastian, extreme right of both pix. also participants in Lakeside in 2006. That little girl, Freddy Runge, is no longer a Little Girl! 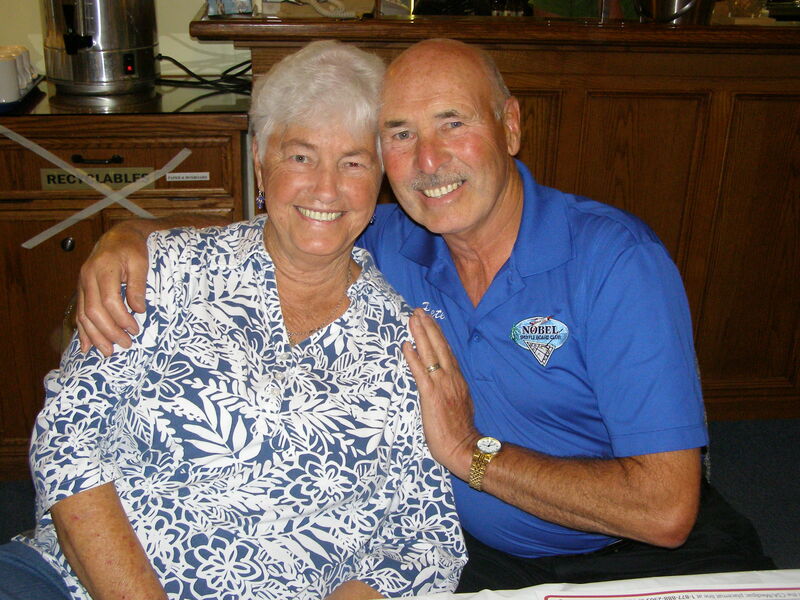 See pic of her and Lois taken in Lakeside, Ohio in 2016. And , the young man in the checkered shirt is now a MASTER SHUFFLER!!! Among the VERY BEST in the WORLD!! I do hope you have enjoyed these articles from my Archives. Stan McCormack writing on 2018 05 10. 2 Responses to Archival Item: Bergs, Erika and Peter, Meet the Hussmanns, Birgitt and Dieter!! January 30th, 2006. Such a nice article. The Hussman’s really are delightful people. Sure nice watching the children grow up…..